Captures all of the good qualities of traditional humbuckers while eliminating the disadvantages. 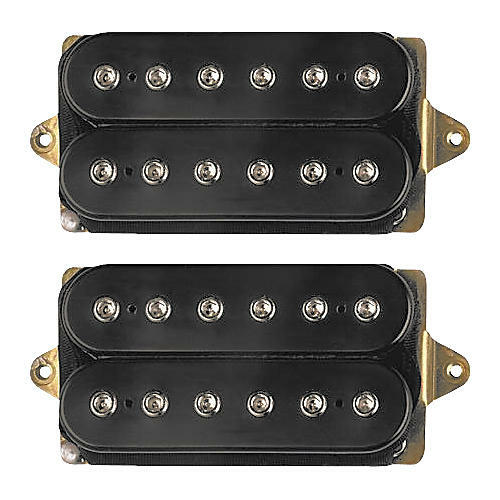 The DiMarzio D Activator Humbucker Set contains one D Activator Neck standard spaced (neck) pickup, and one D Activator Bridge F-spaced (bridge) pickup. Easy to install, they'll bring a variety of powerful new tones to your guitar. DiMarzio took a close look at the most popular active neck and bridge humbuckers to see if they could capture all of the good qualities and eliminate the disadvantages: cold sound, limited dynamics, running out of headroom when played hard, and the need for batteries. The end results are the D Activator Neck and Bridge. They use coils tuned to specific frequencies. The purpose is to shift the resonant points of the pickups to the fundamentals and harmonics that you want to accentuate from the guitar, and they respond instantly to hard or light pick attack. The sound is powerful, clean, and open, with excellent harmonic overtones and very tight lows. The best way to describe the D Activator Neck pickup is that it is big, bright, and open sounding with surprising string - to - string balance. The D Activator Bridge has an enriched harmonic quality and the notes want to sing. Both the D Activator Neck and Bridge pickups were designed to eliminate the sterile edginess commonly associated with active pickups. The D Activator Bridge pickup is about 25% louder than the D Activator Neck. Developing both pickups as a set from the ground up, DiMarzio adjusted the volume levels on the pickups so they are balanced. That way when you switch from the neck to the bridge, you don't hear a drop in volume - also a frequent problem with active pickups. And they don't use batteries. There's a big difference between a pickup that sounds bright and one that sounds thin. A thin-sounding pickup will be brittle on the highest frets and empty-sounding in the mids and lows. The D Activator neck model doesn't do this - both the wound and plain strings remain tight and bright up the neck, and very well balanced. This allows the D Activator neck model to function well in both longer scale bolt-ons and shorter scale, set-neck guitars. An interesting fact about the most popular active bridge pickups is that they aren't incredibly loud. Instead, they have a strong, focused attack that hits the amp very hard and makes them feel more powerful than they actually spec out to be. This is an important characteristic that DiMarzio needed to capture with the D Activator bridge pickup. They wanted to avoid the limiting effect that can occur with active pickups when they are played hard. This pickup is passive with a lot of headroom, and it responds quickly and accurately to changes in pick attack. A hard pick attack doesn't cause the signal to flatten out, and picking more softly or rolling the volume control down lets the sound clean up naturally. Like all passive pickups, D Activators require controls with a minimum value of 250K ohms. 500K is the standard all around value.